The bride and groom sit side by side at a table with their bridesmaids and groomsmen. Oxten created the beautiful centerpiece at the center of the table, with candles hanging from a wood piece surrounded by floral arrangements designed by Elena Damy. The bride and groom turn around in their seats, facing the bridesmaid as she gives her speech. 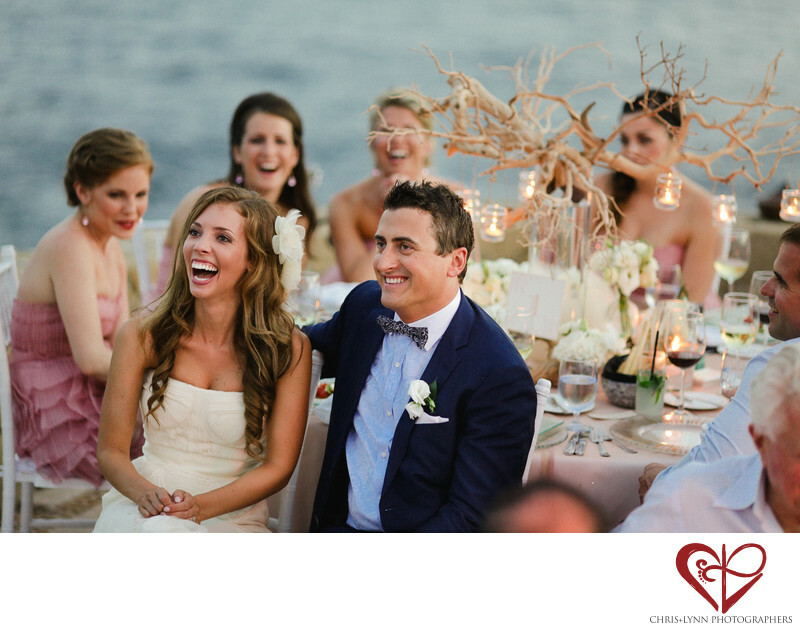 As she recounts her favorite stories and memories, the bride and groom laugh together. The toasts given by friends and family are always heartfelt, and they provoke so many emotions in everyone that hears them. This is the perfect opportunity to tell friends how much they love them and to recall the many adventures that they’ve been through together. Erich puts his arm around Erica’s shoulder as they laugh at the bridesmaid’s jokes and fond memories. 1/250; f/2.0; ISO 1600; 135.0 mm.